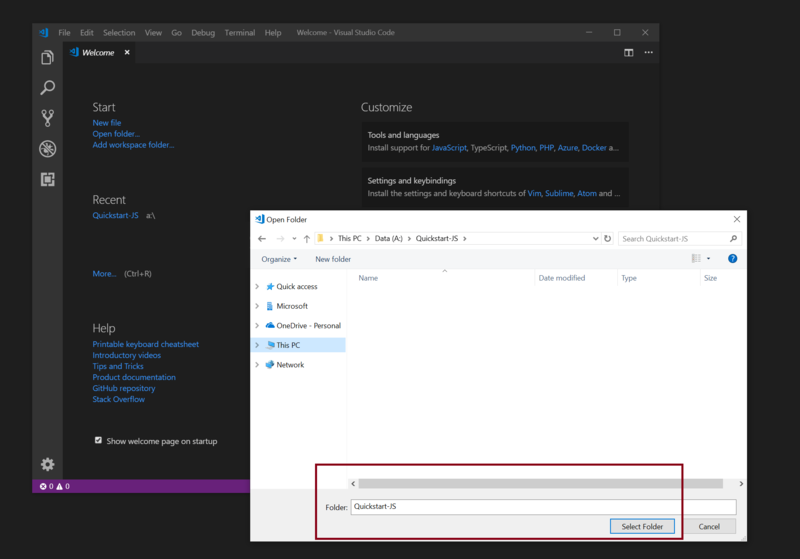 An Azure subscription key for the Speech service. Get one for free. A current version of Node.js. 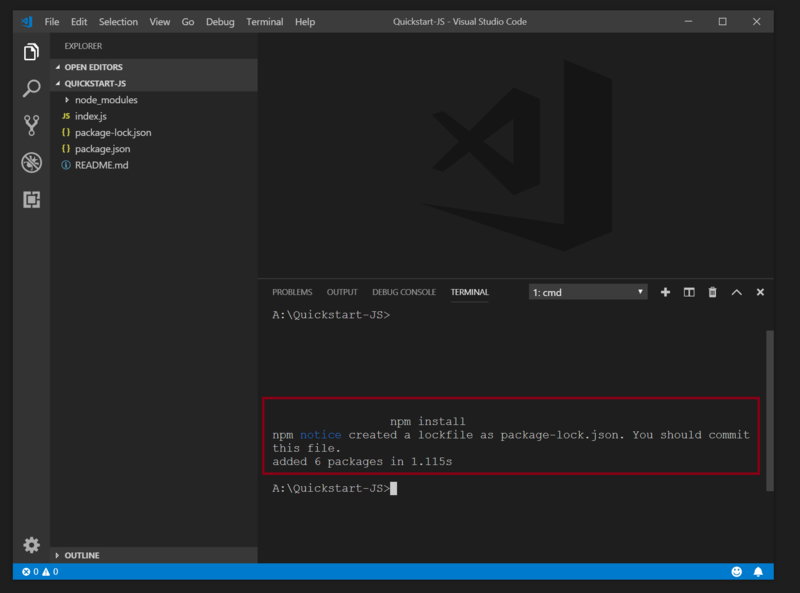 This command initializes the package.json files with default values. You'll probably want to edit this file later. This command downloads and installs the latest version of the Speech SDK and any required prerequisites from npmjs. The SDK installs in the node_modules directory inside your project folder. 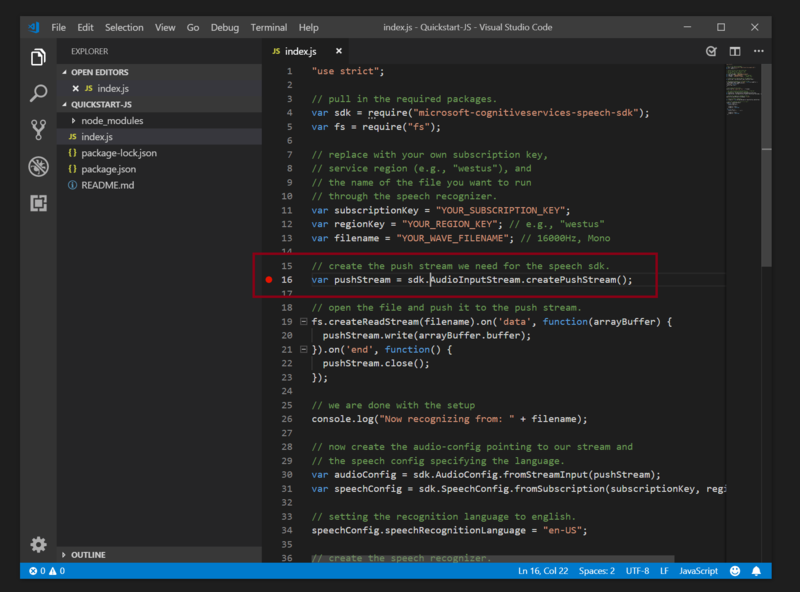 Create a new file in the folder, named index.js, and open this file with a text editor. In Node.js, the Speech SDK doesn't support the microphone or the File data type. Both are only supported on browsers. Instead, use the Stream interface to the Speech SDK, either through AudioInputStream.createPushStream() or AudioInputStream.createPullStream(). In this example, we use the PushAudioInputStream interface. // pull in the required packages. // through the speech recognizer. var serviceRegion = "YourServiceRegion"; // e.g., "westus"
// create the push stream we need for the speech sdk. // open the file and push it to the push stream. // the speech config specifying the language. // setting the recognition language to English. // create the speech recognizer. // start the recognizer and wait for a result. It triggers a recognition by using the provided filename. And it presents the output on the console. 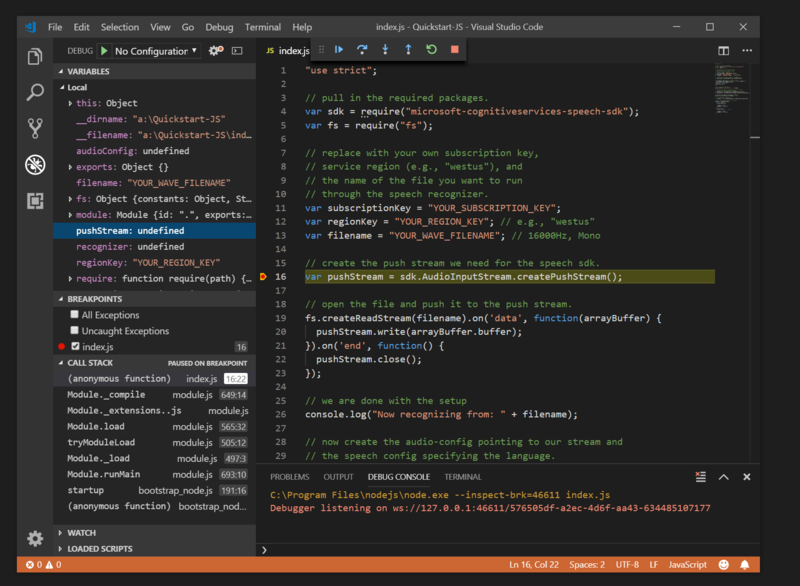 Start Visual Studio Code. Select Open Folder. Then browse to the quickstart folder. 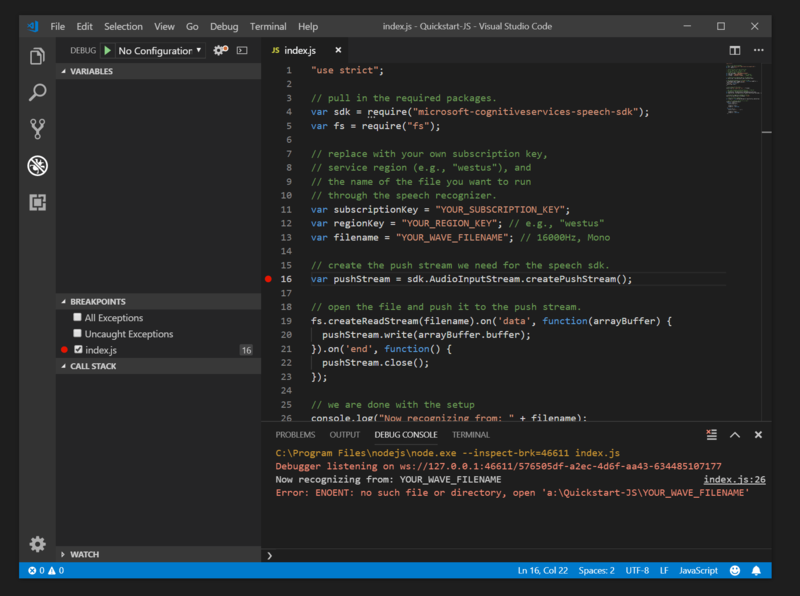 Open a terminal in Visual Studio Code. Run npm to install the dependencies. Now you're ready to open index.jsand set a breakpoint. 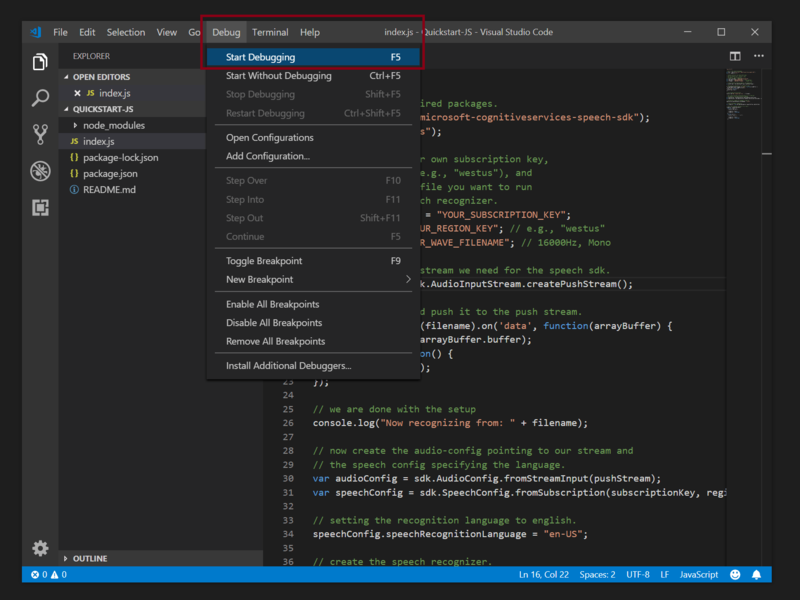 To start debugging, either select F5 or select Debug/Start Debugging from the menu. 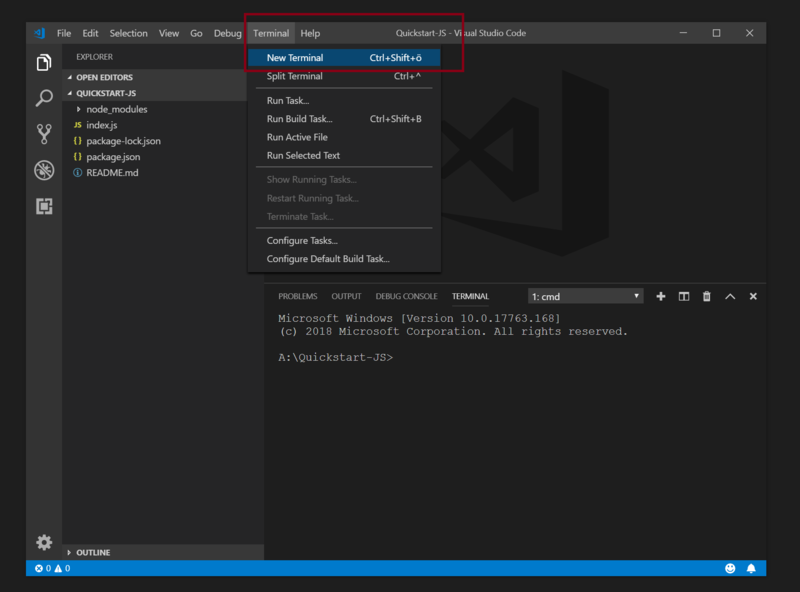 When a breakpoint is hit, you can inspect the call stack and variables. Any output shows in the debug console window.